Leonardo da Vinci’s Last Supper is a Renaissance masterpiece, though it is one which has struggled to survive intact over the centuries. It was commissioned by Duke Ludovico Sforza for the refectory of the monastery of Santa Maria delle Grazie in Milan, and in order to paint it Leonardo used an oil/tempera mix and applied it to a dry wall. He did this because he wanted to capture the look of an oil painting, but even within his lifetime it began to wear off. Further destruction was caused in the seventeenth century, when a door was cut into the bottom (obviously Leonardo’s work was not esteemed at that time like it is today). 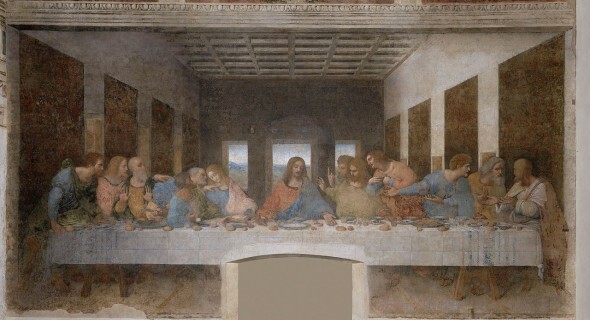 In painting the Last Supper, Leonardo created the effect that the room in which Christ and the apostles are seen was an extension of the refectory. This is quite appropriate, since the Last Supper takes up the basic theme (eating) of the purpose of the refectory. The extension of space that we see here is similar to what we saw with Masaccio’s Holy Trinity fresco, painted in the church of Santa Maria Novella in Florence. Leonardo is thus using some of the same pictorial devices used by his painter-predecessors earlier in the century. The scene shows us figures in a rectangular room with coffers on the ceiling and tapestries on either side of the room. The room terminates at three windows on end of wall and through the windows we can see into a beautiful landscape setting. We see how the landscape in the background terminates in a kind of misty, grayish horizon. This painterly device, in which the horizon’s colors become more dull and colorless, is called aerial perspective and was used by Renaissance artists to create the illusion of depth in landscape scenes. As far as the composition is concerned, Christ is in center among the apostles, and his body forms a triangle-like shape which is not overlapped by any apostles. 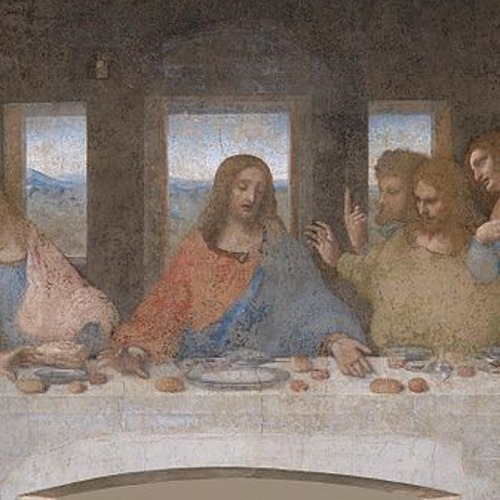 There are four sets of three apostles at the table beside Christ, and these numbers may have been important for Leonardo for symbolic reasons (for example, there are four Gospels in the Bible, and three is the number of the Trinity). We can easily see Leonardo’s use of one-point linear perspective, in which the vanishing point is at Christ’s head (the orthogonals can be seen by following the tops of the wall tapestries or the coffers to where they intersect at Christ), which his also framed by the pediment above and back-lit by the open window behind. Thus, Leonardo was keeping up with the innovative artistic techniques developed early in the Quattrocento. In addition to Christ being the center of the composition, he is also the center of psychology here. The scene we are viewing comes from the Gospel accounts on the night before Christ’s Passion and Death when Christ and the apostles are together in a room for supper. More exactly, we are witnessing them at a point in the narrative after which Christ has made a great revelation to the apostles: one of them will betray Christ (“One of you is about to betray me”, Matthew 26:21 ). He is, of course, referring to Judas, but at this point there is commotion as all the apostles question who the betrayer really is. Although the Last Supper had been depicted in art many times before, this particular moment in the story is one which had not been depicted. This dramatic moment opens a door for Leonardo to explore the psychological reactions of the figures involved. We can see this in the various apostles, who are linked by their hand movements. Emotions range from protest (Philip, #8) to sadness (John, next to Christ) to acceptance (Christ). Judas, however, is shadowed, so that we only see part of his face while he clutches the money bag containing silver pieces. Judas was normally arranged across the table from the other apostles in Last Supper depictions, but here he is depicted in the same grouping as John and Peter. All of these figures would go on to play prominent roles in the Passion of Christ (Judas in the betrayal, Peter with his denials, and John who remains with Christ at the cross). 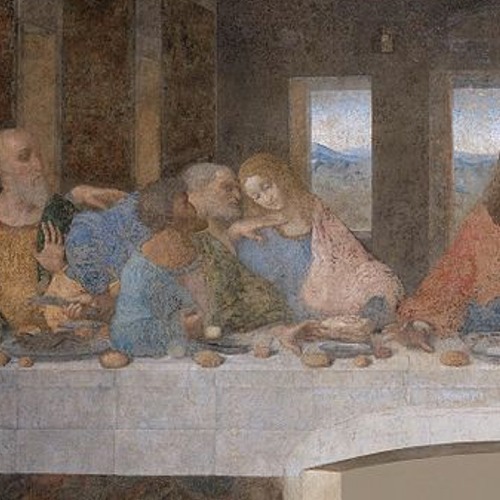 Leonardo’s Last Supper is a type of painting which builds on the early Renaissance painting traditions in areas such as composition and perspective. Yet, it is innovative in terms of its study of emotional reactions and psychological states, all captured in a type of naturalism which was unknown in Italian painting in the previous century. It is thus with Leonardo that we see the beginning of the climactic years of the Renaissance when virtuosity was at its peak, when original ways of depicting figures or scenes came full force, and when the course of European art began to change as we know it. This was the beginning of the High Renaissance. Appreciate this site as it has been most helpful in acquiring info for research for class. Thank you. ItalianRenaissance.org, "Leonardo da Vinci’s Last Supper," in ItalianRenaissance.org, June 21, 2012, http://www.italianrenaissance.org/a-closer-look-leonardo-da-vincis-last-supper/.